Daikon radishes come in a variety of shapes, and some are spicier than regular red radishes. Your local grocer, however, most likely carries the type of daikon that resembles a very large, white carrot. These daikons have a mild flavor compared to red radishes, and they're more adaptable in the kitchen. You can enjoy daikon knowing it's a fat-free, low-calorie vegetable and a rich source of vitamin C.
Daikon radishes, also known as Chinese or oriental radishes, can grow up to 18 inches long and may weigh as much as 5 or 6 pounds. You can eat young daikon raw, but if the vegetable is longer than 8 inches, it's a more mature vegetable that should be cooked, according to the University of Illinois. It's a common ingredient in Asian cuisine, but daikon also works well sliced and added to salads and soups, grated into slaw or roasted with other root vegetables. 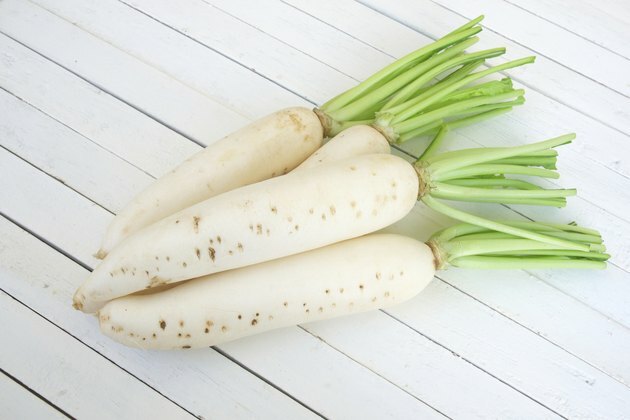 One cup of sliced daikon has 21 calories, 5 grams of total carbs and 1 gram of protein. The "Dietary Guidelines for Americans, 2010" reports that most Americans only consume about 15 grams of fiber daily, which is far short of the recommended intake. If you need to boost your fiber intake, add daikon to the menu. You'll get 2 grams of fiber from 1 cup of sliced daikon radish. Getting the recommended amount of fiber -- 25 grams daily for women and 38 grams for men -- reduces your risk of developing cardiovascular disease because soluble fiber helps lower cholesterol. It also prevents spikes in blood sugar and provides roughage, which keeps your digestive tract regular. Vitamin C is such an important antioxidant that the recommended dietary allowance is based on getting enough to ensure maximum antioxidant protection, according to the Institute of Medicine. Your body depends on vitamin C to produce the connective tissue collagen, which supports your skin, blood vessels and muscles. Collagen is also essential for building bones. Crystals of calcium and phosphorus attach to a core of collagen to create strong, yet resilient bones. One cup of sliced daikon contains 25.5 milligrams of vitamin C. This amount gives women 34 percent of their RDA of 75 milligrams daily, while men get 28 percent of their RDA of 90 milligrams daily. Like vitamin C, copper helps produce connective tissue, but it has a different role. It links collagen and elastin, which adds elasticity to connective tissue in your skin and blood vessels. It also maintains the integrity of connective tissue in your heart. While copper is not an antioxidant like vitamin C, it is needed to synthesize antioxidants found in most of the cells in your body. Other copper-dependent enzymes metabolize iron and produce energy. You'll get 14 percent of your recommended daily allowance of copper from a 1-cup serving of sliced daikon.